LOADSTAR was one of the very first disk-magazines ever published. In 1982 Jim Mangham got the idea of a monthly magazine on disk filled with programs, graphics and text that people would run on their computer. 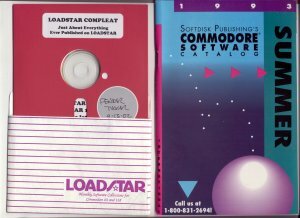 In 1984 the first issue of LOADSTAR, a magazine for the Commodore 64/128 computer was launched and over the next 15 years and 199 issues, a LOT of stuff was published on these disk magazines. Now, every bit of it has been converted to fit on one CD that you can run on your PC -- and there's still room on the CD for more old LOADSTAR things like music, JPGs of the color covers of the issues, and much, much more. ~ .d64 files of every LOADSTAR product published separately from the monthly issues: the Compleat Bible, the Compleat Programmer, all five LOADSTAR Extras, Barbara Schulak's puzzles, etc. ~ and whatever else I could find from the historic LOADSTAR archives.